Special guest compere Mrs Finn Kennedy flying in from France, four professional models and lots of bubbly is a great recipe for Preview's glamorous, exciting fashion show on Tuesday 2nd October at Wincanton Town Hall. 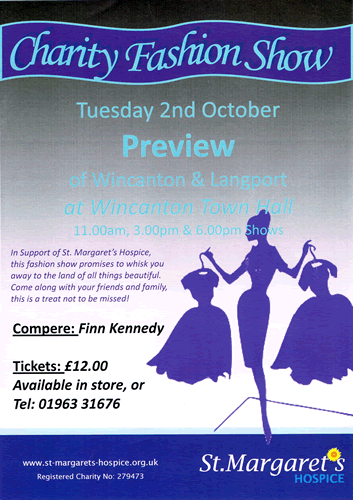 Preview Boutique of Wincanton and Langport will showcase the latest fashion trends for autumn/winter 2012. There is a choice of shows 11.00am, 3.00pm or 6.00pm and tickets are proced at £12.00. Proceeds of the show are in aid of St Margarets Hospice, your local charity committed to providing specialist palliative care, advice, support and respite to patients and their families living in Somerset and parts of neighbouring counties. Care is available for those who have a terminal or life-limiting illness, for example cancer, motor neurone disease and chronic lung disease. In 2010 St. Margaret's celebrated 30 Years of Caring for the people of Somerset. Through medical expertise, nursing skills and specialist support services, they offer physical, emotional, social and spiritual care to patients and their families. Call the shop on 01963 31676 to book your ticket.